Date of Arrest: He was arrested on August 5, before the start of the Halk Maslahat (People’s Council) of Turkmenistan. Sentence: In 2002, he was sentenced to 12 years in prison and disappeared without any information. From 1964-1967 he served in the Soviet Army. From 1973-1979 he worked as a miller in the railroad service. He was a depot master of the Ashgabat Vocational Industrial Institute Number 6. He was also the head of the technical control department, and chief engineer of the Ashgabat repair plant Number 1. From 1979-1980, he was the Deputy Chief of Operations, and Chief Engineer of the Ashgabat Industrial Motor Association Minavtotrans TSSR. In 1980-1986, he served as the Deputy Head of the Department of Transport and Communications of the Office of the Council of Ministers of TSSR. From March 1986, he worked as Deputy Chairman of the Executive Committee of Ashgabat. In November 1986, he was appointed the 1st Secretary of the Leninsk Regional Committee of the Communist Party of Turkmenistan (CPT) of Ashgabat. In 1988-1990, he served as the Head of the Socio-economic Department of the Central Committee of CPT. Beginning in 1998 he also oversaw the oil and gas sector. From April 1990 he was the 1st Secretary of the Ashgabat City Committee of CPT. From January 1991 until May 18, 1992 he was the Chairman of the Ashgabat City Council. On May 19, 1992, he was appointed Mayor of the city of Ashgabat. In June 1993 he was appointed Deputy Chairman of the Cabinet of Ministers of Turkmenistan (Deputy Prime Minister). From April 1997 to May 1998 he was also the Minister of Petroleum and Mineral Resources. From May 24, 1999 till June 2001 he served as the Deputy Chairman of the Cabinet of Ministers, Defense Minister, and Rector of the Military Institute of Defense (assigned to coordinate all Security Departments). This assignment was Niyazov’s attempt to rebuild the Turkmen army after its collapse. In this capacity he became the first civilian to be Defense Minister in the CIS. He was also the Deputy of the 12th meeting of Turkmenistan’s Supreme Council. Sardzhaev was considered by some a protégé of Niyazov and very close to the President. He was regarded very well by Niyazov himself. His removal from office became a grand spectacle, with the three national television channels spending a week strongly denouncing Sardzhaev and accusing him of embezzlement. People who knew him have written online that he was educated, loyal, honest and hardworking. 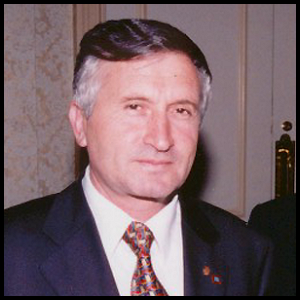 Sardzhaev was noted for his integrity and efficiency at work. Last seen/heard about: On August 23, a routine interrogation ended for Batyr Sardzhaev with a stroke, which paralyzed the right side of his face. According to an insider source, the Attorney General of Turkmenistan, Kurbanbibi Atajanova, fearing the incident, forbade any of her subordinates to report on Sardzhaev’s state, and on the transportation route for his interrogations between the Attorney General’s office and the detention center (SIZO) of the National Security Committee (KNB). Current situation: Unknown. His relatives, friends and the public have no knowledge about his fate. Institute for War and Peace Reporting. “Turkmenbashi Otpravil V Otstavku Populyarnogo Ministra” 21.02.2005. http://iwpr.net/ru/report-news/туркменбаши-отправил-в-отставку-популярного-министра. Accessed on 5 March 2014. Vremya Novostei. “Zhertva vozhdya: Arestovannogo eks-ministra oborony Turkmenii razbil paralich.” 29.08.2002 http://www.vremya.ru/print/26528.html. Accessed on 2 March 2014. Lenta.ru. “Sotrudnik Genprokuratury Turkmenii – “Vremeni novostey”: “U nas tut khuzhe, chem bylo v 37-om godu” 29.08.2002. lenta.ru/world/2002/08/29/niyazov/. Accessed on 8 March 2014. CentrAsia “ Batyr Kurbanovich Sardzhaev.” http://www.centrasia.ru/person2.php?st=1013880204. Accessed on 20 February 2014. Turkmenistan.ru. “Prezident Turkmenistana Naznachil Batyra Sardzhayeva Nachal’nikom Upravleniya Zheleznykh Dorog” 26.06.2001 http://www.turkmenistan.ru/ru/node/12995. Accessed on 2 March 2014. Kommersant. “Turkmenbashi zanyalsya perestanovkami.” 31.07.2002. http://www.kommersant.ru/doc/334417. Accessed on 7 March 2014. Turkmen Helsinki Fund for Human Rights. Posledniye izvestiya o turkmenskom rezhime. 22.06.2004. http://www.tmhelsinki.org/ru/modules/news/print.php?storyid=420. Accessed on 8 March 2014. Vremya Novostei. “Zhertva vozhdya: Arestovannogo eks-ministra oborony Turkmenii razbil paralich” 29.08.2002 http://www.vremya.ru/print/26528.html. Accessed on 2 March 2014.